I figure that overwhelming you with what I’ve been doing lately would be very cruel and oh so unusual. So periodically throughout the day, or rather sitting here and adding more and more posts one after the other, I’m going to be updating my blog like a monkey on crack. There’s just so much to be done. Between fighting the tension beginning to build in my house and dealing with a naturally hyperactive five year old, I’m starting to believe she’s made out of truvia leaves, I got down to business sketching things out. I know the lines of tape are obnoxious and more visible then I would like to see them but just ignore them. Also ignore the fact that I am not an artist and my Project runway sketches would not be fierce. 1. 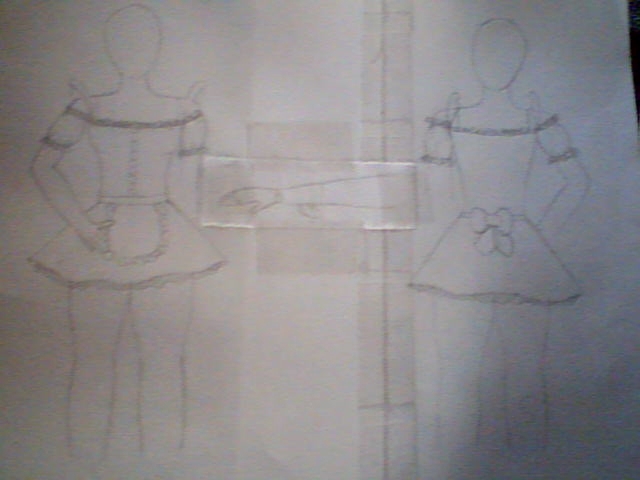 The modification of the original sketch, changing the blouse top to something ‘wench-like’. 2. The skirt is less pleated but the same fullness due to the petticoat beneath it. The skirt is still a circle skirt for the sake of pleats and gathers. It will be built into the top. 3. I’ve fallen in love with the large shoulder ruffles so they’ve stayed as part of the straps. 4. The possible inclusion of fingerless glove armwarmer type things that sport the shape of mudkip’s tail at the bottom back. 5. The apron is still the same round ruffle-y thing with a large bow in the back. 1. I’m still toying with the idea of adding spats to match the armwarmer gloves. It would complete the outfit, sort of like a CardCaptor Sakura outfit. 3. The headband that is bright orange and will have all sorts of embellishments on it. 4. Last but not least, the inclusion of crochet flower panels. It’ll add girl-y-ness and save me some money on fabric. I can’t tell you how much blue yarn has just been lying around the place. Part Three of my costume construction and now it gets a wee bit interesting. I’m actually beginning to work on the different pieces that will be part of my costume as well as giving you some sort of overview of what I’m dressing in. A drawing may be posted up later. 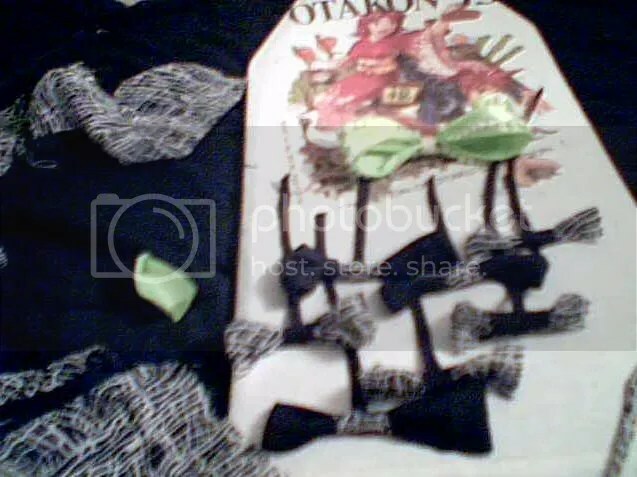 The bows pictured above are bows that I made with the extra fabric from the shirt sleeves and tank top. I like to try and use every bit of fabric, so much so that the strings on the bows are actually bits of the tank top straps and bias lining. They aren’t the greatest bows in the world, a little awkward with unfinished edges. I was feeling lazy so they’re made out of permanent fabric adhesive and left over fabric. But they will serve their purpose. Besides why go through the struggle of setting up a sewing machine and spending hours finishing off edges, binding them and perfecting the bows? The green bow is a hair accessory. Lime green wired ribbon that I glued strings of pearls and individual pearls as well as ribbon onto. I think it looks rather fabulous. Better picture later. And yes that is my mini ironing board which I covered with my Otakon 13 tee shirt. The original cover had a horrible water stain. 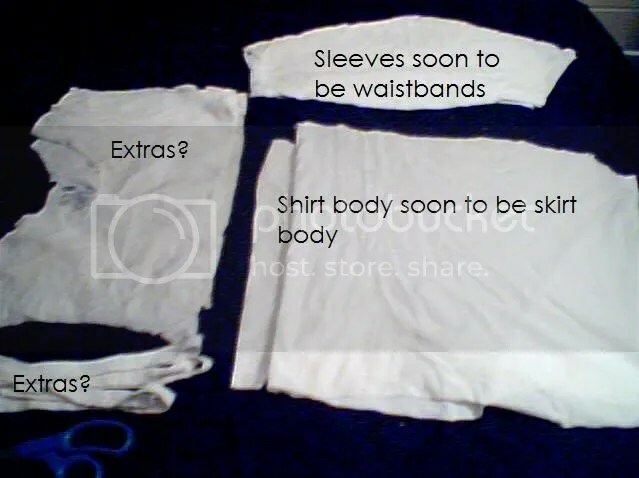 Above is the cut up pieces of two male tee shirts ready to be manipulated into the underskirt. I cut these tee shirts up because they were nice and soft and cozy but almost pretty grimey with stains even after being washed. No one will see them and the main purpose for the skirt is to warm up my legs later and puff up the skirt. Now the stockings are what inspired this outfit to begin with and the amount of stockings I’m using for this project is rather ridiculous but I’m sure I’ll have at least one decent pair left over. The main stockings I’m using are stockings that have holes and runs in them because I don’t groom my nails as well as I should. But I noticed that when I layer stockings and pantyhose for warmth they had a distinct pattern, forming a nice shadow effect. That and control tops look like the bottoms of Lady Gaga’s leotards when worn. To continue with the ‘evil murdered dolly’ look I severed off one leg from two pairs of pantyhose and two legs from one pair of pantyhose. The reason? So no one will see my undies if I’m walking around before the Halloween party even though I did buy lime/black hot pants for the occasion. That and warmth. Halloween is usually a brisk day if not flat out freezing. The other legs will be like thigh highs but I plan on decorating the tops so they don’t slide down. I may put a garter strip connecting control top to thigh high since I was inspired by Option #2 which are stockings with built in garter belt. I didn’t notice until after I opened the package. So if all does not go well with Option #1, these are my alternative. The extras are for the gloves that will more or less have the distressed shadow effect but with pearls along the knuckles…maybe. Also I’ll be attempting a wig so one stocking foot will become a wig cap. Threadbanger saves my life on so many occassions when it comes to inspiration. [Though I did have the Lady GaGa idea before they posted the video of Top Ten Costumes.] I love the Mad Hatter tutorial and figure that a minaturized Mad Hatter Hat would be the cherry to a wonderful Gaga sundae. Now all I need is a hot glue gun.